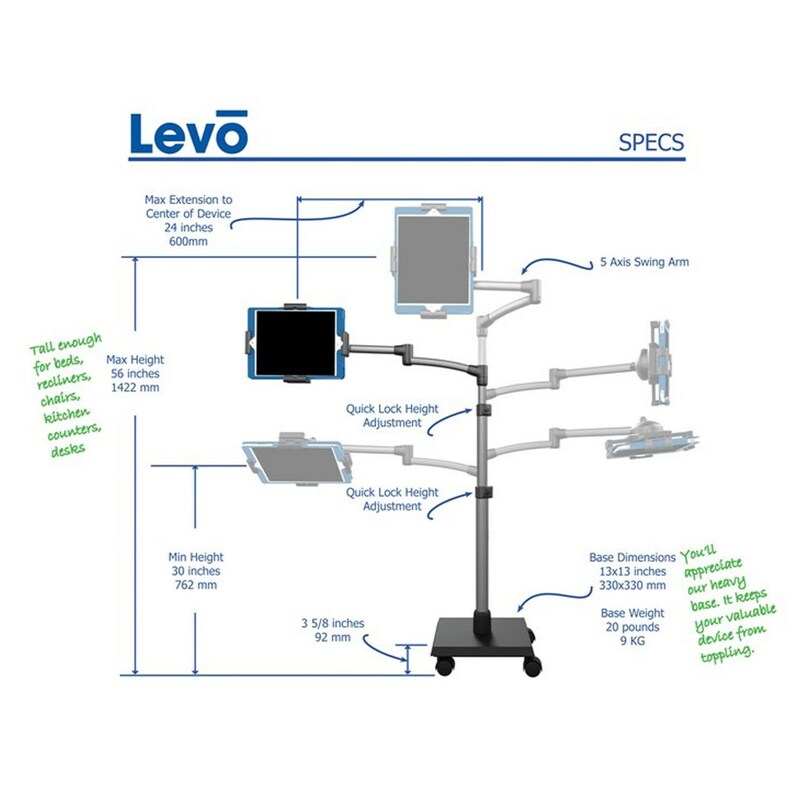 Sit, recline, or lie in bed and LEVO will securely hold your tablet or eReader at the perfect height and viewing angle. Flip lever height locks and 5 axis swing arm quickly swings for fast positioning, then folds when not in use, or when you are ready to exit your furniture. When you return you can quickly swing tablet back into position to continue surfing the internet anytime! Super sturdy construction minimizes annoying bouncing while surfing or typing, and protects your valuable device from tipping over. 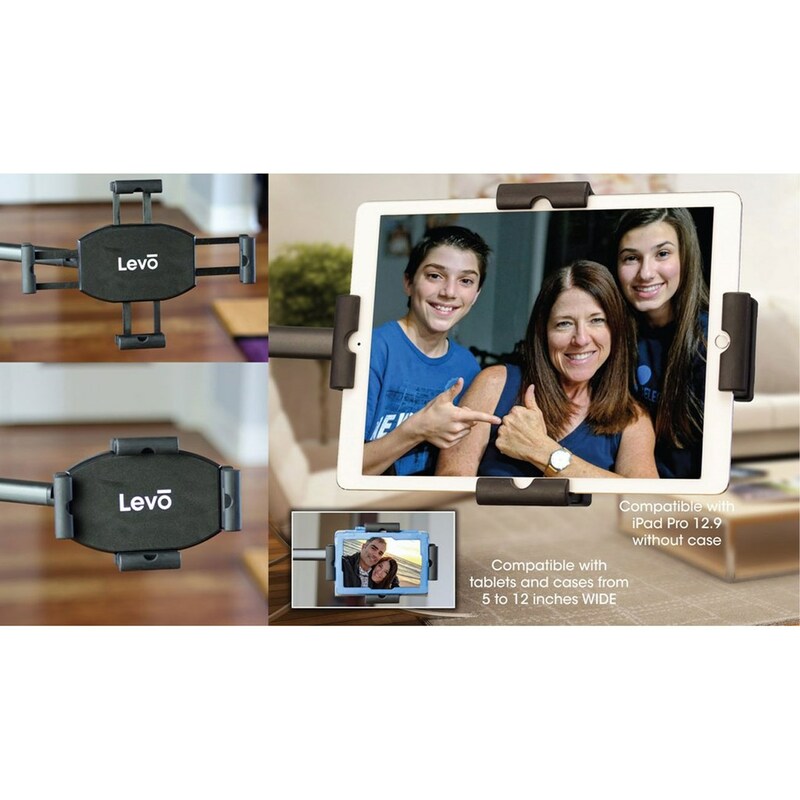 Levo's 20 pound base weight provides a sturdy and secure hold. View your pages or photos with interchangeable platforms so you can quickly switch from electronic devices to books and magazines (LEVO G2 Book Platform sold separately - item 204603). MEASUREMENTS: Minimum height 30 inches, maximum height 56 inches from floor to center of device. Maximum extension to center of device 24 inches. 3 5/8 inches high from wheel to platform. Platform base measures 13 x 13 inches. Height extension available for very high beds and treadmills. COMPATIBILITY: with iPad Pro 2018 and all other iPads, Galaxy tablets, Surface, Zoom, Nexus, Nook, Fire, and other tablets and eReaders with or without cases measuring 13 inches diagonally or less, and weighing up to 4 pounds. 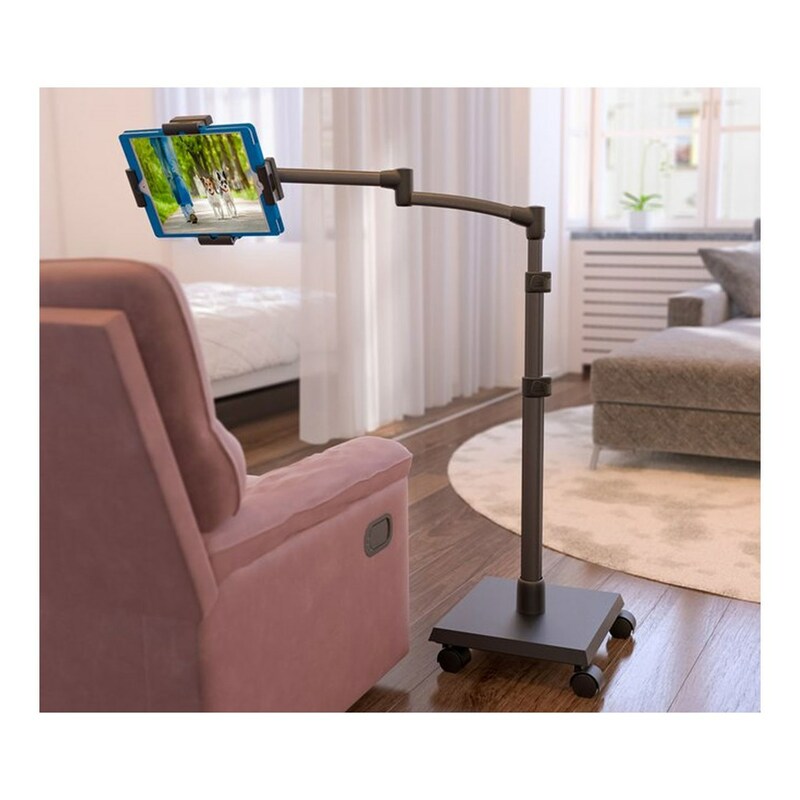 FEATURES: Quicklever height adjustment locks, a handy micro adjustment, a heavy-duty structure, a lustrous anodized aluminum finish, and quick release platforms for interchanging tablets and books (Book Platform sold separately).